I’ve always had a thing for thistles. After all, they are one of the symbols of my ancestors, the Scots. Overtly prickly, thistles bluntly decline to declare their goodness to the world. Most people think them entirely unworthy of notice, let alone the table. But get past that prickly exterior and you will discover depth: sweetness and bitter, warmth and softness, a strange comfort. Yes, you can eat the crowns, roots and unopened flowers of any thistle, but mostly I am talking about our domesticated thistles, the artichoke and the cardoon. I have grown them both in my yard for more than a decade, and they’ve naturalized quite nicely. Here, there is a brief moment when both are in season, and that is late April or early May, when it has not yet grown too hot, and when spring rains prevent the inevitable dry desiccation that comes later. Artichokes most of you have eaten. I use the hearts here, and they are, if you’ve never had one, meaty and rich, with an unusual sweetness about them. Cardoons can be equally meaty — think of them as a cross between an artichoke heart and celery — but have none of the sweetness of their cousin. Even in the dead of winter, a cardoon is a bit bitter, but in the way arugula or a Belgian endive or winter dandelion greens are. They make a great team. Both thistles like to be around fat. Classically, you’d pair cardoons with lots of cheese to make a cardoon gratin, but fatty meats are an equally good choice. But what meat? I happen to prefer both artichokes and cardoons with lighter meats, although artichoke with lamb is very nice. As this is spring, I wanted something lighter, so I dove into my freezer and came out with some ground pheasant from last season. I had shot a few roosters a little too well, so I’d salvaged the meat and ground it with fatty pork. It was practically shouting to become a meatball at some point, and I answered the call with this recipe. Pheasant meatballs. If you have them ground with enough fat (a few rashers of bacon will do), they are every bit as good, if not better, than ground beef or venison. Lighter, better for spring or summer. These are easy-to-make Italian soup meatballs, the sort you’d see in a classic Italian wedding soup. Fun to eat. This soup as a whole has its origin in Abruzzo and Molise, which, roughly speaking, form the “Achilles’ tendon” of the Italian boot. There, it’s normally a dead of winter soup, made with a heartier broth and only cardoons and meatballs. That is absolutely an option if you happen to be reading this in winter. What does it all taste like? 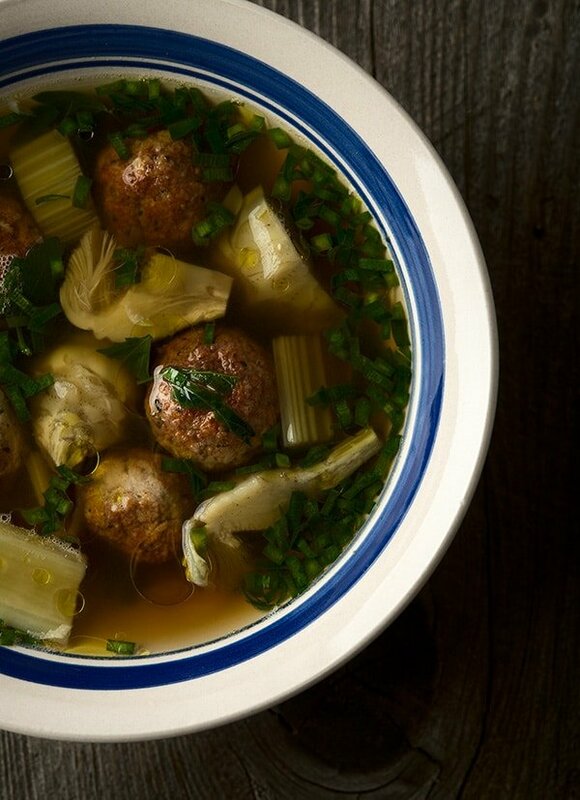 A brothy pinball game of meaty sweetness from the artichokes, a bite of bracing bitter from the cardoons, browned, savory-herby meatball to balance out that last bite, all bathed in a pretty broth studded with fresh green herbs and the occasional sliver of fresh garlic. I can pretty much guarantee you it will be a set of flavors unfamiliar to you — and one you will find yourself coming back to again and again, as you develop your own thing for the humble thistle. This is one of those widely variable recipes I make that can range from a Sunday project to an easy weeknight meal. I like to use fresh artichoke hearts and cardoons because, well, I grow them and I actually like the process of turning artichokes and prepping cardoons. But the easy alternative is to use pickled or preserved artichokes, which you can buy or make yourself with my recipe. As for the cardoons, you can use some celery stalks and get kinda close. Using these substitutions lets you make this soup in fall, when pheasants are in season. And while I do use pheasant for the meatballs, any white meat will work: Grouse, wild turkey, quail, partridge, and yes, chicken. Fish meatballs would work, too. And to be honest, there isn’t any real reason you can’t make this a heartier meal by using venison or beef in both the broth and the meat. It’ll be a different dish, but still good. One thing that will move this recipe from good to great is good, homemade broth. Pheasant, chicken, wild turkey broth — whatever you choose, it will be better in most cases than anything you can buy. This is especially true if you go the fish route. Serve this soup with good bread or roasted potatoes. Cook Time: 45 minutes, less if you’re skipping the cardoons. Bring a large pot of water to a simmer. As the water is heating up, whisk in the flour until it dissolves with no lumps. Add the other half of the lemon juice and the olive oil, plus a healthy pinch of salt. Watch the pot, as the flour in it will make everything want to boil over. Once you are at a nice simmer, add all the cardoon pieces and artichokes. Simmer until everything’s reasonably tender, between 15 and 30 minutes. You want there to be a little al dente bite left in the thistles. Turn off the heat and let them sit in the water for the moment. 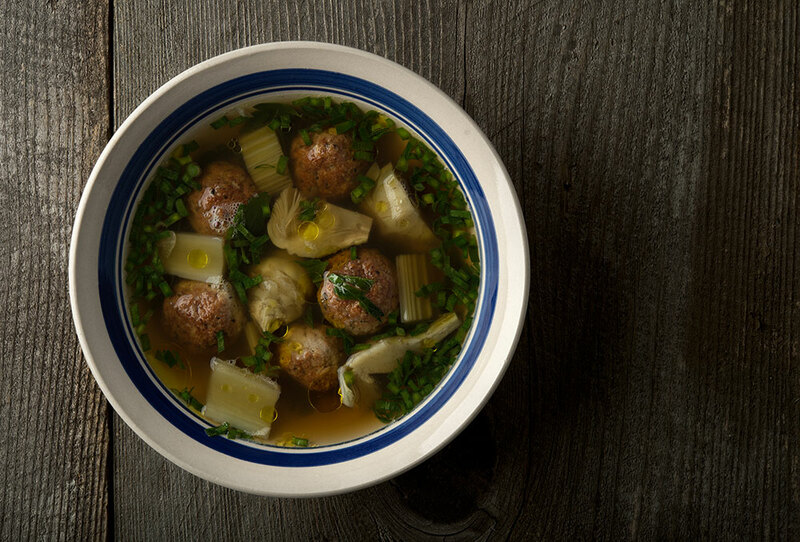 The moment you drop the cardoons and artichokes into your simmering water, put all the meatball ingredients into a bowl and mix well. Form little meatballs — remember these are for soup, so two bites is maximum size, at least for me — and set them on a tray. There’s a good chance you’ll be done making meatballs when the cardoons and artichokes are ready. Pour a few tablespoons of olive oil into a large pan and brown the meatballs. Set them on a paper towel to drain when they’re done. Note that there’s no need to cook the meatballs all the way through yet. You just want them nicely browned. Now you’re ready to put the soup together. Heat the pheasant broth in a soup pot over medium-low heat. Add the sliced garlic cloves. Drain the artichokes and cardoons and add them to the soup. Add the meatballs. Note: If you’re using preserved artichoke hearts and celery stalks, now is the time to put them into the soup. Let everything simmer very gently — no boiling, or the soup will get cloudy — for 5 minutes, then add the chopped parsley and chives. Let this cook another minute, then serve with grated cheese over everything. Hank – what’s the purpose of adding the flour to the simmer for the artichokes and cardoons? Mark: It helps set the color, somehow. It’s an old Mediterranean trick I learned.